Set in the deep reaches of space, Cosmos Conundrum offers great opportunities for creativity and staging to be explored. There is so much to see as Martians, Crater Critters, Aliens and Stars of the Milky Way sing and dance their way through this fabulous show. Great space sound effects accompany 13 performance items that vary in style from rap to pop and also in form, from songs to dance numbers and creative movement. The difficulty of these items varies but there are items suited to most age groups. Each item can be performed by a separate class with the entire cast coming together to perform the anthem styled final song. The show can be rehearsed with each group learning its part and then coming together to rehearse the whole show and in terms of set dressing, only a simple space themed backdrop is required. If performed with energy, confidence and humour the show should be a terrific and entertaining concert show, highlighting all aspects of the performing arts in the school: dance, drama and music. 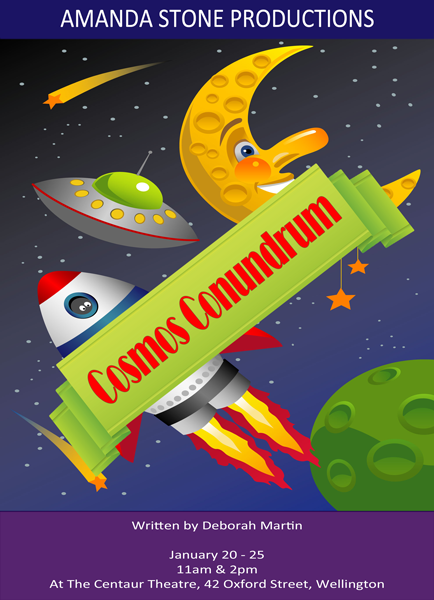 Cosmos Conundrum tells the simple but fun story of an unknown craft, driven by the man in the moon, as it zooms around the solar system causing havoc and consternation. Sightings of this activity manage to cause a media storm which catches the attention of Professor Dalrymple and his assistant, Beamlea, who set out to try and find out who or what is the cause of all this. On their journey they meet everyone from the sun, planets, stars, Martians and Crater Critters living on the moon to Captain Bob and his space crew. Watch as they encounter a range of different space characters and take the audience along with them on a fun and colourful tour of the solar system. This show features 12 chorus groups, a number of supporting characters and 5 lead characters in its cast. The actors can rehearse their parts in their own groups and then begin to work with each of the different performance groups as the show begins to come together. The 5 main characters remain in the wings throughout the show as they come on and off regularly and tie each of the performances together to form the narrative. The first set of main characters are Coral, Tod and Tanya who are members of the press who appear throughout the show as they attempt to solve the mystery of the unknown space craft. The other two lead characters are Professor Dalrymple and his assistant Beamlea who are also attempting to get to the bottom of this space craft mystery. These 5 roles provide continuity and a lot of humour to the show and should be played by some of the more senior students who can perform with confidence. A number of supporting characters are encountered as the audience follows the journey of the leads and include Captain Bob and his crew, Martians and Crater Critters. The 12 chorus groups perform during key scenes of the show like the take-off and when a new group of characters is encountered.